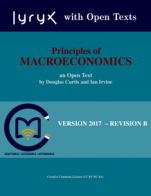 Principles of Macroeconomics is an adaptation of the text, Macroeconomics: Theory, Markets, and Policy by D. Curtis and I. Irvine (and edited by Lyryx Learning), and presents a complete and concise examination of introductory macroeconomics theory and policy suitable for a first introductory course. Examples are domestic and international in their subject matter and are of the modern era -- financial markets, monetary and fiscal policies aimed at inflation and debt control, globalization and the importance of trade flows in economic structure, and concerns about slow growth and the risk of deflation, are included. This text is intended for a one-semester course, and can be used in a two-semester sequence with the companion text, Principles of Microeconomics. The three introductory chapters are common to both books. Cover image is under a CC BY-NC-SA license (https://creativecommons.org/licenses/by-nc-sa/4.0/). Principles of Macroeconomics (Lyryx) by Douglas Curtis, Ian Irvine, Lyryx Learning Team is licensed under a Creative Commons Attribution-NonCommercial-ShareAlike 4.0 International License, except where otherwise noted. Despite the authors' assertion that the text is the essential information students require in Principles of Macroeconomics, I find this text to be comprehensive. the authors do not have side topics or special features to distract the students but the authors are very thorough. In my opinion, only chapter 4 regarding economic activity and performance is stripped down to the essentials. The necessary concepts are covered in the text. There is the inclusion of an explanation of decentralized e-money such as bitcoin. Special purchase and resale agreement (SPRA) as well as, sale and repurchase agreement (SRA) are defined in the chapter on money. The aggregate demand and aggregate supply model is presented in inflation rate and real GDP space. This is a definite plus. My students often have difficulty moving between the concepts of static price level and inflation in the alternative presentation of the AD/AS model. There is a significant historical context for monetary policy in Chapter 10. It builds up the student’s understanding of the Taylor rule. This chapter references the effective lower bound of monetary policy. In my opinion, this is an excellent chapter for guiding principles students though an understanding of monetary policy. In Part Four, Real GDP, Business Cycles, Policy and Growth, the authors' presentation of the material is extensive. An instructor desiring a more conversational tone will find this section of the text challenging for his/her students. For example, the discussion on controlling the public debt includes the equation for keeping the public debt ratio constant. The text introduces the concept of a backward bending AD function in real GDP and inflation space at the zero bound. The comprehensive treatment of monetary and fiscal policy under fixed and flexible exchange rate regimes in chapter 12 was one area that I think exceeds the requirements for a Principles of Macroeconomics course. The authors use algebra throughout Part 4 including the Cobb-Douglas production function in Chapter 13. A glossary is provided as well as student practice questions with solutions but chapter learning objectives are omitted. There are some minor errors or omissions but overall accurate content. I began reviewing version 2017 - revision A, but Version 2017 - Revision B was released while I was in progress. So I have reviewed the revision B.
I am delighted by the timely and clear updates presented in Version 2017-Revision B. Looking forward five to ten years, the in-depth historical context of monetary may be challenging for some instructors to update. However, as the context changes a fellow OER champion may provide this vital information. Overall I find the text to be relevant and have longevity. Principles of Macroeconomic texts are not generally renowned for their accessibility and clarity. Of the texts I have examined in the marketplace, this text is less conversational than some. It uses mathematics and graphs effectively. Students for whom mathematical presentation is a barrier will struggle. This text is best suited to an instructor who utilizes and explains the algebra within the context of the course as opposed to one who focuses on the verbal and graphical presentation while using minimal algebra. Yes, the authors have broken each part of the text into logical sections and each chapter into modules. An introduction of the AD/AS model is presented in Chapter 5 before the aggregate expenditure and aggregate demand curve are developed in Chapter 6. The chapter on markets includes a section on government intervention in the market. The text makes consistent microeconomic references to concepts such as elasticity, sunk costs, marginal product, and constant returns to scale. I did not find an explanation of convergence in the text although it is mentioned. I had no trouble with the interface at all. I examined the text in hard copy, on-line in the Lyryx Learning Management System as the "Lesson" and as a downloaded e-text on my tablet. I am in the 45-54 age group and so I did not find that I enjoyed reading the "Lesson" on-line. I preferred the hard copy/e-text options. There are very few errors. I did not examine this text from the context of the perspective of the Truth and Reconciliation Commission's Calls to Action. In comparison to other Principles of Macroeconomics textbooks on the market, I found the language to be acceptable. Instructors could adapt the exercises to be more relevant to BC. For instance, one question refers a holiday to Florida. Working with the OER an instructor could change the reference. This text is best suited to an instructor who utilizes and explains the algebra within the context of the course as opposed to one who focuses on the verbal and graphical presentation while using minimal algebra.